Ignorance and defective thinking styles lead to religious superstition. A poor understanding of the physical world is linked to religious and paranormal beliefs in a new study. A recent study published June 2016 in Applied Cognitive Psychology connects belief in the supernatural (religious and paranormal beliefs) with poor reasoning skills, low information about basic physics and biology, and a propensity to assign intention and mentality to non-mental phenomena (magical thinking). The results showed that supernatural beliefs correlated with all variables that were included, namely, with low systemizing, poor intuitive physics skills, poor mechanical ability, poor mental rotation, low school grades in mathematics and physics, poor common knowledge about physical and biological phenomena, intuitive and analytical thinking styles, and in particular, with assigning mentality to non-mental phenomena. 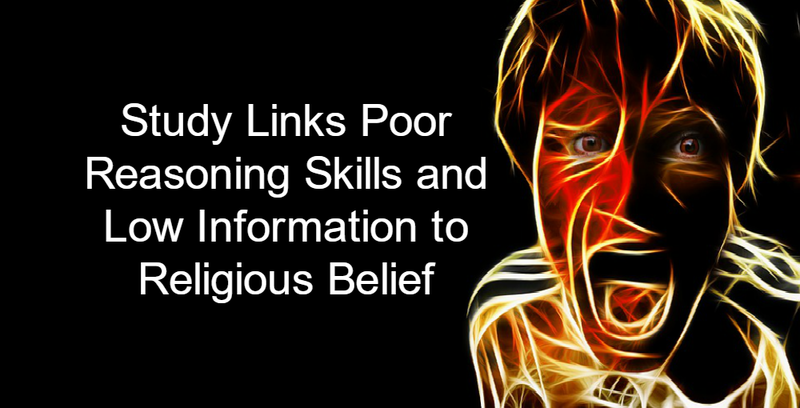 Bottom line: The study results are not particularly surprising, and merely confirm what many others have long suspected: Religious and supernatural beliefs are often associated with poor reasoning skills and low information about the natural world. Good News: Despite a vocal minority of Christian extremists, religion in the United States is in decline, and secularization is on the rise. A new study finds a slow decline in American religiosity over time, demonstrating that religion in the United States is declining and mirroring patterns found across the western world. The new research shows that contrary to anecdotal evidence, the United States is no different than other modern societies in the inevitable move towards secularization. According to the new research from UCL and Duke University published in the March 2016 edition of the American Journal of Sociology, there is a slow, steady drop in the number of Americans who claim religious affiliations, attend church regularly and believe in God. — 94 percent of Americans born before 1935 claim a religious affiliation. For the generation born after 1975, that number drops to 71 percent. — 68 percent of Americans 65 and older said they had no doubt God exists, according to the study. But just 45 percent of young adults, ages 18-30, had the same belief. — 41 percent of people 70 and older said they attend church services at least once a month, compared to just 18 percent of people 60 and younger. Virtually every discussion of secularization asserts that high levels of religiosity in the United States make it a decisive counterexample to the claim that modern societies are prone to secularization. Focusing on trends rather than levels, the authors maintain that, for two straightforward empirical reasons, the United States should no longer be considered a counterexample. 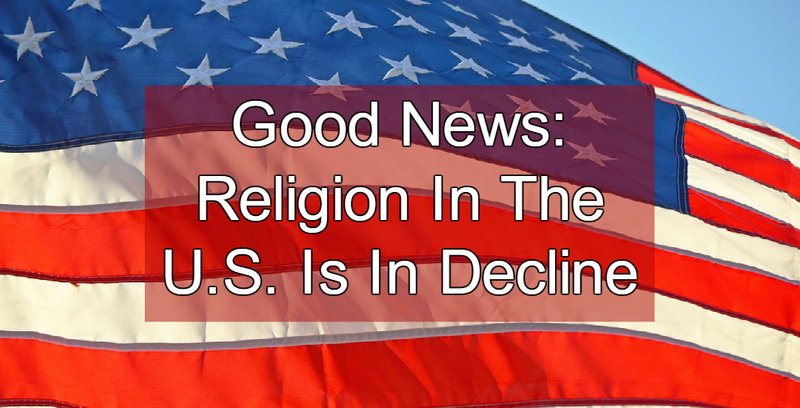 First, it has recently become clear that American religiosity has been declining for decades. Second, this decline has been produced by the generational patterns underlying religious decline elsewhere in the West: each successive cohort is less religious than the preceding one. America is not an exception. These findings change the theoretical import of the United States for debates about secularization. None of these declines is happening fast, but the signs are now unmistakable. It has become clear that American religiosity has been declining for decades, and the decline is driven by the same dynamic — generational differences — that has driven religious decline across the developed world. The US decline has been so gradual that until recently scientists haven’t had enough data to be sure the trend was real. The US has long been considered an exception to the modern claim that religion is declining, but if you look at the trajectory, and the generational dynamic that is producing the trajectory, we may not be an exception after all. Bottom line: This is good news. Despite the perverse Christian extremism of some Americans, things are getting better, and religious superstition is on the decline in America.